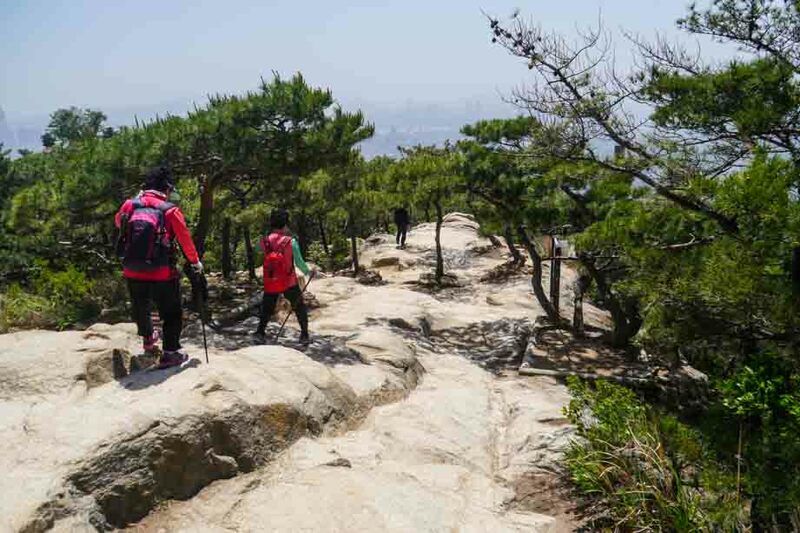 There are more than a few mountains to hike within Seoul’s city limits ranging from fairly easy to difficult–I chose what was listed as a moderate hike followed by an easy one. It was a day of hiking Yongmasan (용마산) and Achasan (아차산), two of the more popular hikes easily accessible by the Seoul metro at Yongmasan Station on Line 7. In retrospect, I followed the opposite path of most hikers. The more popular route is from Achasan to Yongmasan. Nonetheless, it was an adventure with wonderful views of Seoul. I started from Yongmasan because it seemed easier to get to. From the station, it wasn’t as easy as anticipated as I had to wander through an apartment complex to reach the park. While I didn’t have detailed directions from the station or GPS, I found the man-made waterfall that’s near the trailhead. The road nearby had a locked gate, which made me believe the trail was closed. It turned out that the Yongmasan trail began after passing through the outdoor exercise equipment and playground, which led to a small path to the mountain. The hike up Yongmasan wasn’t too difficult, though some parts were more dangerous and rugged. There were a few steep slick rocky areas to hike up and down on both mountains–I’m really not sure if it’s easier to hike up or down these rocks. Either way, it makes the hike a little slower. 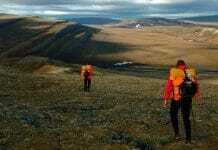 The trail itself is long, but the altitude is not a concern for this hike. 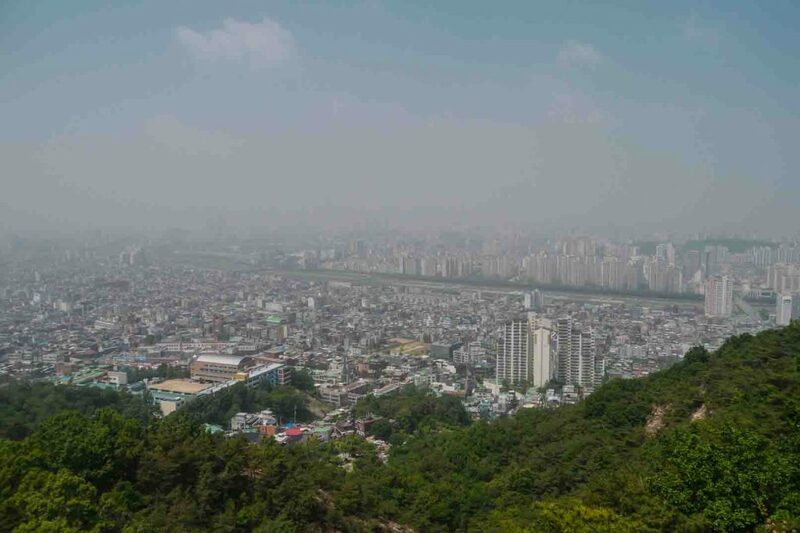 The peak at Yongmasan is only 348 meters while Achasan is 287 meters. There were multiple paths along Yongmasan and Achasan, and most signs are only in Korean. I found a few in English, but they at locations where directions weren’t needed. There was almost never an English sign when I needed it, especially when there were multiple paths to choose from. I had to ask a few people which way to go–and while they didn’t speak English, they understood my game of charades. I would say, “Yongmasan,” and then point in a few directions, at which point they’d correct me. I noticed a few people using map apps–that would’ve been great if I had service, but I hadn’t yet purchased my local SIM card. My preparation for the hike was lacking. I had forgotten to pack a snack before leaving my apartment. I should’ve also brought along a second water bottle. When I reached the summit of Yongmasan, I was people picnicking. They brought along blankets and full meals for the hike. One guy invited me over for a cup of makgeolli, a cloudy semi-sweet, and lightly carbonated liquor. He didn’t speak English and I didn’t speak Korean, but he was happy to share a drink with me. 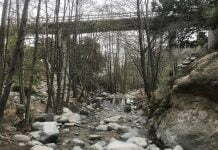 He pointed me in the direction of Achasan so I could continue my trek. As I got closer to the summit of Achasan, I was tired. I was a bit out of shape as I hadn’t taken a hike in months. The lack of packing food for the hike didn’t help. The view from Achasan was pretty much the same as from Yongmasan, particularly as it was a bit hazy. Along the hike, I passed a few Buddhist temples and shrines that weren’t of much interest, as I had already visited so many temples around Asia and these didn’t have many unique features. However, there were some well-maintained paintings and collections of Buddhist figures. Along the mountains are the remnants of forts dating back to the Joseon period–I only came across one of them on my trek, but there are more in the area. There were also quite a few outdoor gyms, with weight benches and everything–local hikers use the equipment during breaks in their hikes. I followed the crowds either coming up or going down in the hopes that I was heading the right direction to get back into the city. As I exited the park, I followed another group into town because I had no idea which way to go at the intersection. The group was not, in fact, heading to Achasan Station or Gwangnaru Station (both are near the trail to Achasan), and I ended up a little lost. I managed to find a coffee shop to use Wi-Fi to check my map and ask directions. One of the employees spoke English and pointed me in the direction of the nearest subway station after I finished my coffee. Have you ever been Hiking in Seoul Korea? 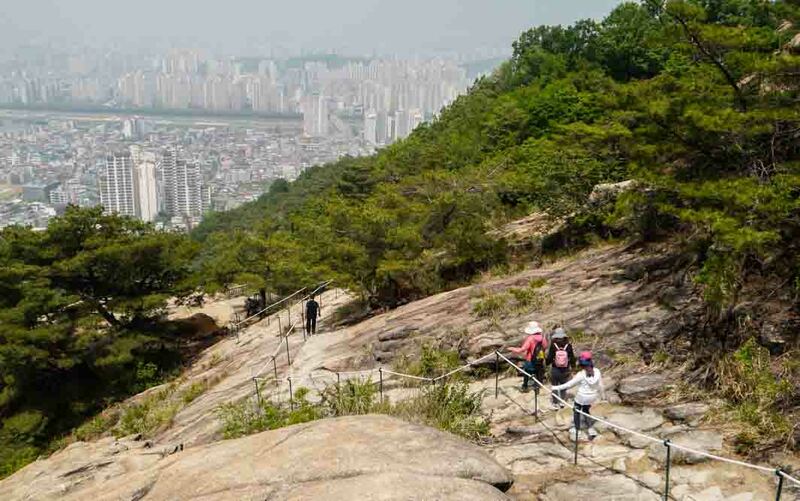 Have any suggestions for trails or feedback on Achasan Hike or Yongmasan Hike? Please leave a comment below, we love reader feedback!